Schoenus apogon Roem. & Schult. Culms erect, flaccid, terete, striate, nodeless or 1-noded, 3–25 (occasionally to 55) cm long, 0.5–1.2 mm diam. 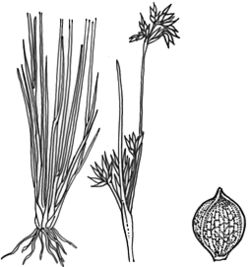 Leaves with blade to 15 cm long; sheath straw-coloured to dark red-brown, striate, ± shining; mouth glabrous; ligule present. Inflorescence of 1 loosely hemispherical cluster of 6–16 spikelets, usually with 1–4 clusters below, erect, 1–15 cm long; lowest involucral bract to 17 cm long. Spikelets narrow-ovate, acute, 1–3-flowered, 2.5–7.5 mm long. Glumes 4–6, lowest 2–4 empty, narrow-ovate, acute, red-brown to blackish, shining, with glabrous margins, midvein often scabrous; fertile glumes 2.0–5.5 mm long. 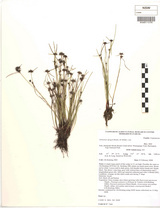 Bristles 5 or 6, not plumose, shorter than or equalling nut. Stamens 3; anthers 1.0–3.2 mm. long. Nut trigonous, obovoid to subglobose, 1.0–1.2 mm long, 0.6–0.8 mm diam., ± 3-ribbed, reticulate-pitted to trabeculate, glabrous, shining, whitish. Distribution and occurrence: Grows in seasonally wet habitats; extending inland to eastern Western Plains; NC CC SC NT CT ST NWS CWS SWS NWP SWP; Qld, Vic., Tas., S.A., N.Z., Japan. Other Australian states: Qld Vic. Tas. S.A.
A variable species, which may include more than one taxon.